The Barn in Chattarpur is a stark contrast to the rustic retreats that have cropped up close to Sohna Road. It’s clean, modern and quiet; a perfect getaway for a busy couple looking to get away from the city. The cottage is set on a 2 acre horse farm and comes with a stable, a garden and a lot of peace and quiet. 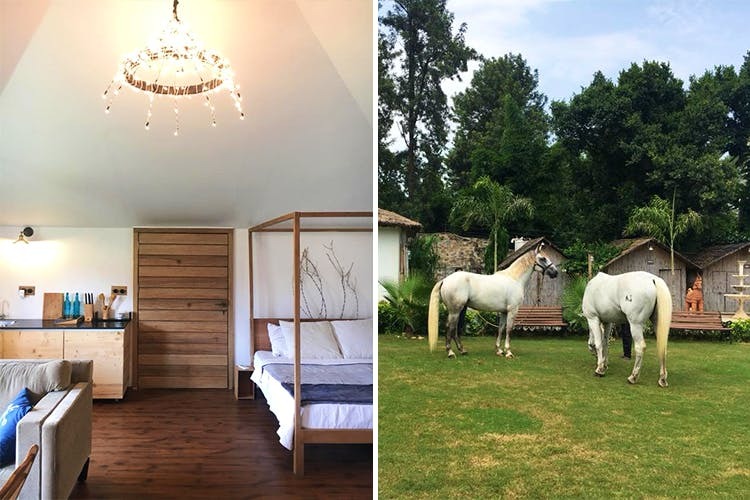 The hosts, a hospitable couple whose love for horses is common knowledge, make sure that you’re checked in and comfy, but are totally unintrusive… Just what you’d like when you’re running away with bae to reconnect/kick back. While there isn’t much to do in terms of activities and adventure, we love the relaxed pace of life here. After all, when was the last time you walked around the lawn without a care in the world, or stayed in bed and ordered in breakfast? Oh, and not to forget dinner at the stables, or languorous walks with the friendly horses (there are more than 10 of them at the property). The hosts tell us that the garden gets visited by peacocks when the weather’s not playing mean. If you don’t mind cooking together, you can hit up the kitchenette and whip something up (it’s also well-stocked, if you want to be lazy). When you’re done eating and Netflixing, you can play fetch with the farm dog who loves visitors. But most of all, we think you’ll dig the cottage itself. So minimal, so tastefully decorated – an image straight out of a decor magazine. Want a family get-together, a night away from the house or just a stunning location for a shoot? The Barn’s got you covered. Don’t try picking a fight or putting other pressing commitments on hold for the sake of a vacation that’s too ambitious. The Barn is worth an attempt even if you got just one night to spare. The tariff is INR 4,500 a night.